Back after many days with a post, this may confuse all the readers, but don't get desperate after reading it. While a new project execution many a time during analysis, it will be a nail biting situation waiting for result, especially this will help you while you are desperately waiting for a Assay content in a liquid product layer. But before that, i should deliver some basic things to ensure that it will be in reach of every one. Assay is nothing but just the actual content of something desirable in a sample which we need to determine. What are the ways to determine the Assay ? 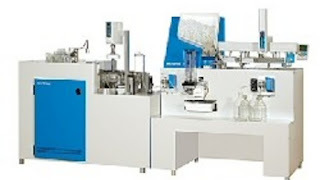 In a Pharma industry, Usually Assay will be determined based on a standard, i.e., there should be a 100% pure active content material which is used to compare the sample with the standard. P is potency(concentration) of standard [ usually it will be 100%]. The above mentioned thing a Quality Control related strategy for Assay determination, but we process engineers should be somewhat smart than those guys, to get a rough view about the result. How to calculate volume occupied by torispherical dish ? Forget to mention that, if you reading the post to determine standard's assay content, this is useless. This post will help you to know the product content in the final organic/aqueous layer that to only if the final solvent is having a single solvent, for binary solvent mixture this might not be helpful. I'll give you a Case study, during a product manufacturing in the final weight declaration, we need to concentrate a product layer sample in a lab distillation setup and based on the final concentrated residue, we need to calculate and declare the weight. Lets our product is in Acetonitrile solvent, total product layer qty is 2000 L.
Sample Qty. 500 ml, Weight of sample is 410 gm. 500 ml of acetonitrile should weigh around 500*0.786 = 393 gm. So now the difference is 410-393 = 17 gms. ( 20.73 / 100 ) x 2000 = 414 Kg. That's it.....!!! Hope you understood.......!!! Any queries feel free to comment / message me....!!! What is TR, how to calculate it ? MC shall be performed with karl fisher reagent.